It has certainly been an interesting year at the movies with many unpredictable turns at the box office. Studios may finally be getting the hint that audiences want diverse movies with women and minorities in lead roles. WE WANT THESE STORIES! Two of the biggest box offfice hits of the year had female leads with Beauty and the Beast ($504 million) and Wonder Woman ($412 million). Horror hits like Stephen King’s IT and Jordan Peele’s directorial debut Get Out saw audiences flocking to these for a good fright. Studios should hopefully be getting the hint that we are tired of blow ’em up blockbuster franchises as the fifth entries of Pirates of the Caribbean and Transformers severely under performed. Marvel is still untouchable despite cranking out three films in 2017 with Guardians of the Galaxy Vol.2, Spider-Man: Homecoming, and Thor: Ragnarok all garnering positive reactions. My Top 10 is an eclectic mix featuring choices you may not find on other year-end best lists. Pixar continues to astonish with their magical original stories and the innovation it takes to create them. 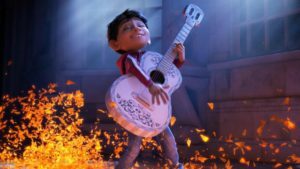 With Coco, they invite the audience into a world and culture that may be unfamiliar. The celebrations around Dia de los Muertos showcase the cultural importance towards family and honoring those who came before us. Staying true to the Mexican culture was vitally important, and they utilized an all Latino cast with Gael García Bernal, Benjamin Bratt, Edward James Olmos and Alanna Ubach. The older crowd will want to have a tissue nearby, as you will inevitably think about your grandparents and the memories you carry of them. Kumail Nanjiani, best known for HBO’s Silicon Valley, found a way to make a movie about a sensitive subject one of the funniest movies of the year. He turned the story inward as he co- wrote the film with his wife loosely basing it on their story. It explores what happened was she was suddenly hospitalized with Kumail having to face her family’s apprehension toward him. At the same time, he knows he’s disappointing his family for not following Pakistani traditions regarding relationships and marriage. It’s one of the best romantic comedies in years as it always feel authentic with just enough cringe-worthy family moments along the way. 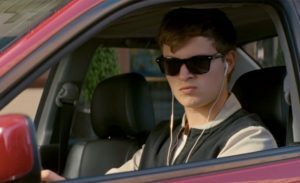 If The Fast and the Furious movies were turned into a musical, it would be Baby Driver. No one sings in the movie, but music drives the literal action and choreography of the chases at hand. It stands above the rest as one of the most original movies you’ll see this year. There have been many other movies about bank heists and the crew behind them, yet Baby Driver still feels fresh. The film’s soundtrack will have you tapping your toe as it feels perfectly curated to carry Baby along on his ride into personal destruction. The soundtrack is insanely eclectic with The Commodores, Beck, Carla Thomas, Simon and Garfunkel, and Focus to name a few. It’s high on action while keeping its consistent wit and sense of humor. With Wonderstruck, Todd Haynes made his first film catered to all audiences. It’s an homage to the silent film era, but divided audiences due to it being uncharted territory for him as a director. He tells two different stories as two deaf children experience New York City for the first time hoping to find answers about their families. He gets wonderful performances from Oakes Fegley, Julianne Moore, and newcomer Millicent Simmonds. He’s constantly playing smart for his audience shying away from cheap fart jokes and seamlessly floats through a variety of genres. The stakes were incredibly high for director Rian Johnson, but he makes one of the most satisfying and compelling Star Wars films to date. He successfully found the balance of keeping the Star Wars tone while moving it ahead in a new direction. This new trilogy can’t just be a rehash of the originals, nor can it perfectly match the stories and looks fans of created in their own heads about what they want. Johnson strengthens and deepens what we know about the Force and the role it plays in all of us. 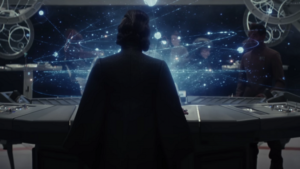 There’s conflict, heartbreak, surprises, and an unpredictable nature that kept The Last Jedi in high gear from beginning to end. Lady Bird is truly one of the best coming of age movies released in years. It may seem like a fun and innocent high school romp kind of movie, but then Greta Gerwig hits you about an hour when you realize how much you have come to care about all of these characters. Gerwig has a winning ensemble with truthful performances from Saoirse Ronan, Laurie Metcalf, Lucas Hedges, and Timothée Chalamet. The film speaks to that concept of identity and the names and labels we feel comfortable placing on ourselves. There’s an authenticity with what Gerwig brings to the screen as a writer and director, which can’t be denied. 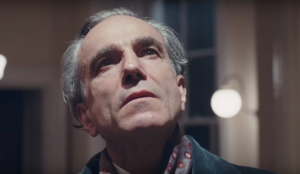 The reunion of director Paul Thomas Anderson, actor Daniel Day-Lewis, and composer Jonny Greenwood is a marriage of divine cinema magic. Anderson is back in top form with a film that is visually lush and extravagant, much like the dresses made by Daniel Day-Lewis’ character. If this is Day-Lewis’ final film than he ends on a high note fully embodying his character with the same precision he is always known for. He’s extremely flawed and mesmerizing, and to watch fellow actresses Vicky Krieps and Lesley Manville go head-to-head with him leaves the audience with some of the best confrontations seen on screen this year. Steven Spielberg continues his streak of making historical dramas following Munich, Lincoln, and Bridge of Spies. He has an A-list cast tackling the story of how the Washington Post risked everything to disclose secret government documents exposing decades of cover up by the White House about our involvement in the Vietnam War. 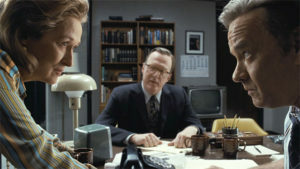 The movie was rushed into production, shot, and edited faster than most movies, which parallels the pressure the journalists felt to get their story published. Spielberg clips the movie along quickly making you feel that deadline approaching with a story that feels far too topical give its the themes of freedom of the press, feminism, and the current White House’s negative rhetoric against the media. It’s easy to get swept up in Elio and Oliver’s budding relationship thanks to the dynamic performances from Timothée Chalamet and Armie Hammer. The film oozes with sensuality and heat, and you can instantly feel yourself basking in that Italian getaway. Director Luca Guadagnino never rushes a beat with the back and forth tug of war these two characters face when it comes to their sexuality in a time and place where it was not socially acceptable. It’s based on the acclaimed André Aciman novel and is an emotional roller coaster about that that specific time when we are forced to deal the truths within ourselves. With Dunkirk, Christopher Nolan has crafted the best war film since Saving Private Ryan. 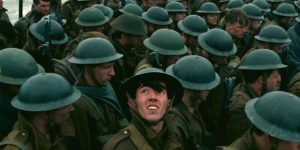 His trio of interweaving narratives (by land, air, and by sea) gives a unique and holistic look to a war film with an approach not often utilized. He shows quite a bit of restraint with his less is more approach and keeps the film moving at a brisk pace. Along with D.P. Hoyte Van Hoytema, his adamant choice of shooting the film using IMAX cameras gives it that immersive feel that demands to be experienced on the big screen. It’s loud and in your face and the reason why going to the theater is so important for a movie like this. THE ABSOLUTE WORST OF THE YEAR...Ooofta. 1. Rings – REALLY?!?! Did we really need another entry in this horror franchise? 2. Fifty Shades Darker – Somehow, it made the first film look like the Citizen Kane of romances. 4. King Arthur: Legend of the Sword – Guy Ritchie failed miserably with the most recent attempt at Camelot. PERFORMANCES OF NOTE – 45 of them!